PedalSnake® Systems span the distance between the pedals and amp (see The PedalSnake System). A configurable multi-channel BaseSnake™ is the core component of a PedalSnake system. Two types of Pigtail Kits—G-Lines (1/4" GuitarLines), and P-Lines (PowerLines)—can plug into BaseSnake channels, allowing the PedalSnake System to be customized to any rig. For more see BaseSnakes and Pigtails. Channels have 5pin DIN plugs (like MIDI plugs). So used by themselves BaseSnake channels can replace MIDI cables, or other lines with DIN plugs (like some footswitch cables, etc). See Three Types of BaseSnake Channels. Plug G-Line® Pigtails (1/4” GuitarLines) into BaseSnake channels to replace your 1/4" cables. Choose single mono, dual mono, or stereo, all offered as 2-Packs, with a 15” Pigtail for each end of a channel. For more see BaseSnakes and Pigtails and G-Line Pigtails Info. Plug P-Line® Pigtails (2.1mm PowerLines) into BaseSnake channels to connect power supplies, which move to the backline, to pedals' power inputs. Power supplies move to the backline to enable the "one cable only" solution, aka the Low Voltage Method. Then an AC power cord no longer needs to be run out to the pedal area. For more see BaseSnakes and Pigtails and P-Line Pigtails Info. Supports one-way MIDI signal only, no phantom power, which can be used with MIDI footcontrollers powered by external power supplies (instead of phantom power thru the cable). MIDI signal is all they require in the cable. Can replace an amp footswitch cable hvaing 5pin DIN plug with 3 pins wired (this is rare). All G-Line Pigtails work on a 3wire channel. * MF1-H is limited to (roughly) 500mA on a 3wire channel. This is enough to power for a 20 or more 9V stomp boxes. * MF1-H becomes a Hi Current P-Line when used on a 5wire channel (see below). This is limited to (roughly) 1000mA. Can replace an amp footswitch cable having 5pin DIN plug (5 pins wired). 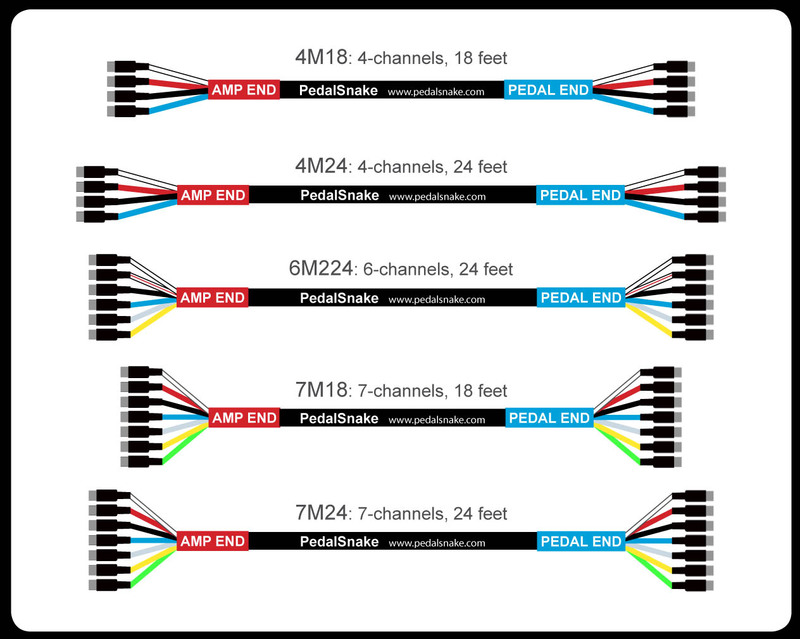 Choose 4-, 6-, or 7 channels, and 18 or 24 foot lengths.